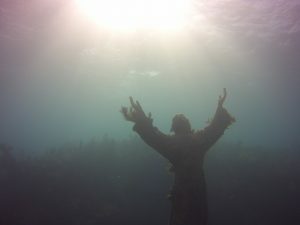 Island Ventures most popular requested site by Divers and Snorkelers alike is The statue of Christ of the Abyss. The statue of Christ of the Abyss is one of 3 located in different parts of the world. The statues are all cast in bronze from the same mold. Guido Galletti cast the original statue. In 1954 the statue was submerged in Genoa Italy to inspire people to visit the underwater world. 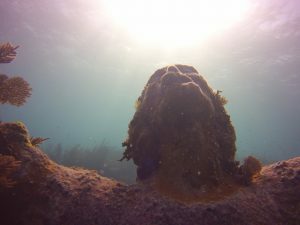 A second statue was submerged in Grenada to remember those saved from the Italian ship Bianca C. which sank in the harbor. The third casting was commissioned by Italian dive equipment manufacturer, Egidio Cressi and donated to The Underwater Society of America in 1962. Finally submerged at John Pennenkamp state park, Key Largo on 25 August 1965. The statue of Christ of the Abyss statue stands in 25 feet of water. The outreached arms are less than 10 feet from the surface. A great snorkel site where you can see the statue from the surface or dive down to see the statue close up. Do not touch any part of the statue as over the years it has become covered in fire coral. Photo opportunities are great for divers with the statue and afterwards many channels and gullies to explore. Divers can navigate to and from the statue just remember to keep your right or left shoulder facing the reef wall. To return turn around and let the other shoulder face the wall until you return to the statue. The reef has a lot of fish life to see but as always the best way to see them is to move slowly and quietly and they will come to you! Southern sting rays are often seen. Like to one shown here right in the gully where the statue plinth is. 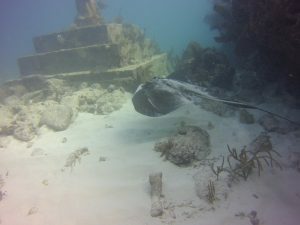 Rays dig themselves into the sand and divers can quite often swim straight over them. When your diving over a sandy seabed look at the sand to see if any part of it is different from the rest of the area and then look for the tail as often sticking out. We watched this Ray for a few minutes when it decided it had enough of our company and left! Nurse sharks and turtles sit in the nooks and crannies of the reef formation so move slowly and keep your eyes peeled! Horseshoe or North Dry rocks are good for second dives or Grecian for snorkel.